STORMONT’S Justice Minister David Ford has launched his own blueprint for tackling sectarianism in Northern Ireland – but his decision to break ranks with government colleagues highlights renewed tensions in the administration. Mr Ford says the DUP and Sinn Féin are unable to deliver a comprehensive deal on tackling divisions between Protestants and Catholics, amid signals that the gulf between the two largest parties has widened over the ongoing Union flag protests. This comes as Stormont faces a series of hurdles in 2013, including the impact of the loyalist flag protests on the marching season, the fears over continued dissident republican violence and the prospect of finalising talks on restructuring both the Assembly and local councils. Stormont parties also face ongoing divisions over major policy areas including the reform of welfare and education, and dismantling the Housing Executive. The Alliance leader’s proposals for building a shared future include a new policy on the divisive issue of flags as detailed here, but he also raises concerns over continuing divisions in government. “Certainly things don’t seem to be good in terms of relationships, at the moment,” he says. “While we were promised delivery on a number of issues back last summer…we’ve only seen a minority of issues coming through. He adds: “We have a difficulty that when people can’t agree we either end up with something amounting to deadlock, or something amounting to really the lowest common denominator. Stormont’s politicians have overcome greater hurdles in the past, and talks between the DUP and Sinn Féin are ongoing, but there are several reasons why the next 12 months could prove a testing period. The flags crisis has further divided politicians who were already at odds over controversial loyal order parades. The summer of 2012 ended with a bitter dispute around marches along Belfast’s Donegall Street, after loyalist bandsmen were filmed playing a sectarian song outside a Catholic church. The episode fuelled wider tensions and was linked to major street violence, with security forces identifying members of loyalist paramilitary groups as being involved. It also sparked a split between government parties at Stormont, after unionist politicians publicly attacked the Parades Commission for restrictions it placed on the contested marches. The fallout, previously reported here by The Detail, sparked demands for negotiations to be held over the winter period to defuse the issue before the start of the 2013 marching season. But the eruption of the flags crisis in December has not only undermined hopes for successful parades talks but also added an additional layer of loyalist grievance and further strained political relations. Senior figures at Stormont are now concerned the flags protests might extend into an already difficult marching season. But while the security and political implications of failing to defuse tensions have been highlighted, there could be other costs. Ministers have warned that the scenes of widespread violence associated with protests against the restricting of the flying of the Union flag at Belfast City Hall have sent a damaging image overseas. This comes as dissident republicans opposed to the peace process have continued to launch murder bids on police officers and recently claimed the life of prison officer David Black. The combined fallout has blunted two of the only tools the Assembly has to bolster the economy – tourism and inward investment. Enterprise Minister Arlene Foster has tried to direct energies towards forthcoming events that offer the potential to claw-back reputation. Highlights in the 2013 calendar, include Derry-Londonderry’s term as UK City of Culture, plus the arrival of world leaders for the G8 summit in Co Fermanagh in June and the prestigious World Police and Fire Games in August. The events provide positive platforms to help signal the fundamental strengths of the peace process and widespread support for it. But politicians are also alert to the potentially negative impact of such high profile international events taking place against a background of continued violence. Even before the renewed risk of street violence, Stormont leaders already faced a year of delicate political negotiation on key pieces of legislation and on restructuring the power-sharing government to boost efficiency. Politics at Stormont has been characterised as a process of rolling negotiation between the two dominant parties, the DUP and Sinn Féin. And while progress has been made on key issues, including the reorganisation of the future size and structure of the power-sharing government, the weeks ahead will make clear if deals can be secured or if a bigger logjam will form. 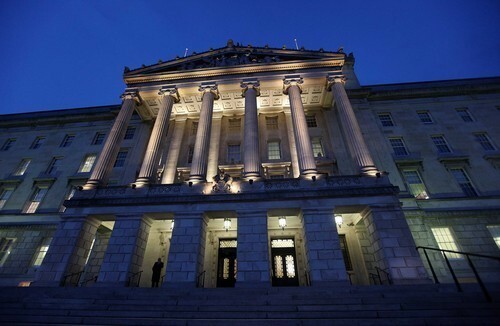 The Executive’s Programme for Government promises legislation on re-shaping the Stormont administration by 2013/14, with a view to implementing changes which may include a cut in the number of ministerial departments when the Assembly term ends in 2015. Extending the life of the Assembly into 2016 is an option that is open to the politicians and confirmation of agreement to do so might provide breathing space. The DUP in particular has pressed for the need to reduce the size of government, from Stormont’s current tally of 12 departments. There is general consensus on the potential to downsize, but each party has its own priorities. The SDLP has already said the price of its support would be a ramping-up of north-south cooperation which it feels has been restricted by unionists. The creation of mechanisms to allow parties to go into opposition has also been discussed. A more prominent proposal was that the Assembly cut the number of MLAs – but delivering on that has become more complicated. Proposals by the Westminster government to cut the number of Northern Ireland constituencies would have forced a drop in Assembly seats. But that plan has been potentially derailed by divisions in the coalition government in London. An alternative open to Stormont is that it cuts one seat from the six MLA posts currently available in each of the existing 18 constituencies. But it is being argued that this would have a disproportionate impact on smaller parties, risking the emergence of a less-representative Assembly. This argument has greater potency at a time when the flags crisis has already signalled a disconnect between the Assembly and some communities. in addition, a further round of negotiations could open-up over the legislation framing Northern Ireland’s new 11 councils. The Alliance party has already demanded the inclusion of a policy of flying the flag on all councils on designated days. Nationalists have also sought agreement on the display of symbols and emblems to reflect diversity – a demand that could also affect Stormont and the new councils. The ongoing negotiations present potential for tension, especially if parties begin to throw other demands into the political pot, but if agreement can be secured they also offer a chance to demonstrate progress. When the DUP and Sinn Féin decided to share power in 2007, a period of political turbulence was perhaps inevitable. But the Assembly term ushered in by the 2011 election was supposed to be different – a chance to get down to business. Politicians were presented with the luxury of a three-year window during which no elections were planned. The holiday from the electoral cycle was interrupted by the shock decision of the deputy First Minister Martin McGuinness to stand for the Irish Presidency. The move, aimed at further boosting Sinn Fein’s profile in the Republic caused a political storm in the south, with unsettling ripples undulating northwards. Sinn Féin again surprised observers by removing its MPs from the Assembly to end double-jobbing, though Martin McGuinness instead resigned his Mid Ulster Westminster seat to remain at the helm in Stormont. The Mid Ulster by-election is expected to be held within weeks. Sinn Féin is in pole position, but the battle will nevertheless be fought against the troubled backdrop of the flags crisis, the tensions within unionism and republican demands for a poll on Irish reunification. The rest of this year risks being a politically turbulent period, at a time when Stormont’s election-free window is beginning to close. Next year will see elections to Northern Ireland’s new 11 local councils, which will be established in shadow form until the transition of powers is completed by in 2015. The election of the new councils will take place on new electoral boundaries and could spark greater political interest in the wake of the flags crisis, especially in Belfast. In addition, elections to the European Parliament are due in June 2014 and could also prove contentious. At the last European contest the DUP saw-off the challenge from Jim Allister of Traditional Unionist Voice, but the party nevertheless suffered its worst ever European result, while Sinn Fein topped the poll for the first time. The next Westminster election is scheduled for May 2015, while the next Assembly election is currently scheduled for the same time – but that could change. Stormont can ask to have the Assembly poll put back to May 2016 – an option offered in order to avoid a clash with the next UK General Election, but which would also bring Stormont into line with Scotland and Wales. The SDLP, however, is understood to be among those concerned at holding the next Assembly election around the period marking the 100th anniversary of the 1916 Easter Rising. But in the era dubbed ‘the decade of centenaries’ such coincidences of history may be hard to avoid. As for 2013, politicians face a by-election, a delicate marching season, plus political negotiations. And before the end of the year they might also begin to turn their minds towards the prospect of fighting four elections in a row.